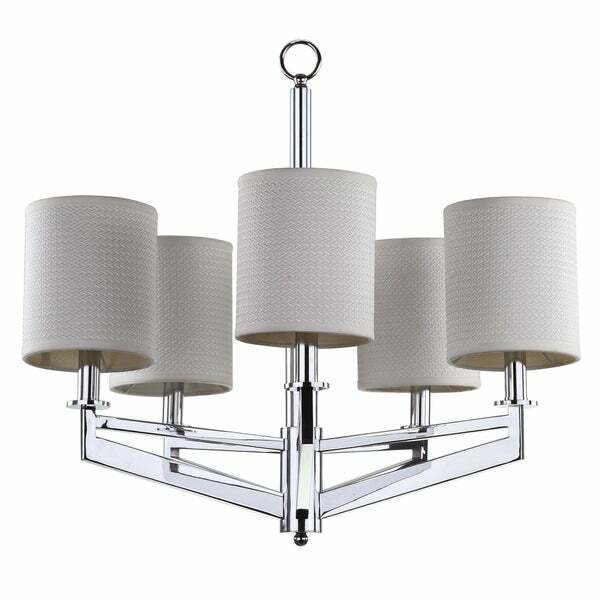 Safavieh Lighting 26-inch Adjustable 5-Light Axis Chrome Chandelier - 26.125" x 26.125" x 23 - 95"
Safavieh Lighting 25-inch Adjustable 5-Light Lenora Chrome Drum Pendant Lamp - 25" x 25" x 8-44"
Safavieh Lighting 25-inch Adjustable 5-Light Catena Gold Chandelier - 25" x 25" x 17.5 - 53.5"
A study in straight-lined simplicity, the contemporary Axis chandelier in gleaming chrome is softened with white cotton shades featuring a tone on tone geometric motif. Axis is ideal for a refined modern look in a dining room, living room or entry hall. Add a bit of texture and shine to any room with this chandelier. The white linen shade offers an interesting juxtaposition to the sleek chrome frame, bringing a modern look that gleams and offers warm, inviting light. The 95 inch chain is adjustable, making it easy to hang the light at the perfect height. Dimensions 95 in. H. x 26.1 in. W. x 26.1 in D.
What a beautiful complement to our Dining Room. We've received numerous complements from our guests. The lighting is perfectly distributed over our table, the shades are mid formal but casual looking during the day. We made a perfect choice. A gorgeous and yet affordable chandelier. I have vaulted 12’ high ceiling in my master suite. This chandelier was the perfect addition. Modern yet classic because of the shades. Not 5 stars because took me a while to make the shades straight after installing them. I purchased this for a home renovation. It has a nice transitional style that works with numerous design styles. The fixture is sturdy and provides plenty of light, especially if you use LED bulbs. Good purchase. This chandelier is nice, doesn’t knock your socks off or anything dramatic like that. The shades are kind of annoying they just dont seem to sit quite right in my opionion. Love the fact it is chrome and feels and looks substantial. "Is the chain adjustable? Can this be shortened to a semi-flush look?" Hello jessann99, yes, the chain is adjustable. Thanks for shopping with us! "How long is the chain? I have an 11' ceiling." Safavieh Lighting 26-inch Adjustable 5-Light Talia Gold Chandelier - 26" x 26" x 22.625 - 58.625"
Safavieh Lighting 24.5-inch Adjustable 5-Light Meredith Bracelet Chrome Chandelier - 24.5" x 24.5 " x 21 - 57"